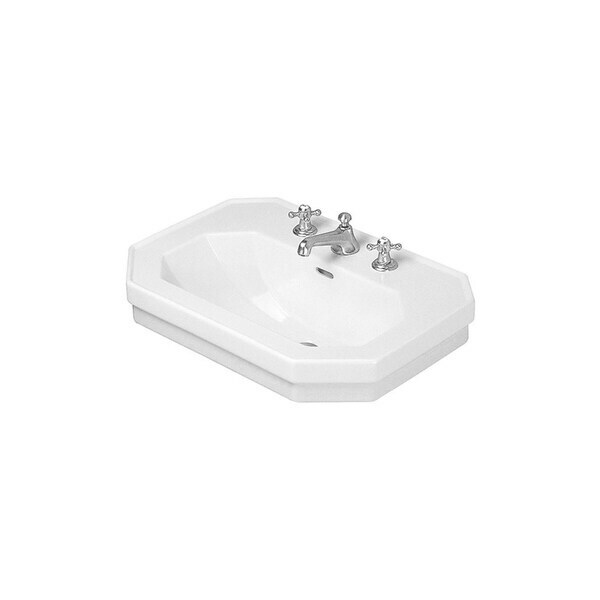 Solid construction and works with the Duravit 857910000 1930 Pedestal. No scratches or chips + arrived in great condition. Made from vitreous China and punched to accommodate a 3-hole faucet of your choice, this handsome white bathroom sink is an excellent way to update the decor of your bathroom. The single bowl design and included overflow make it convenient as well as stylish. Dimensions 27.0 In. X 19.0 In. X 11.0 In. "What is the faucet spread and can I please confirm exactly what's included? Description says "shroud", pic and copy detail sink"
This has 3 tap holes punched. This model is for the sink only.